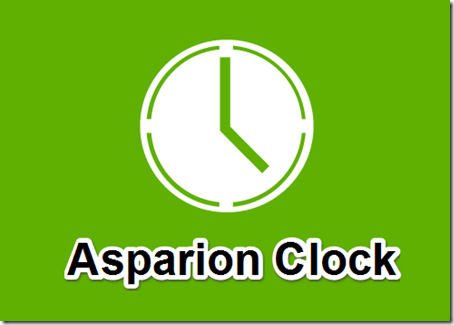 Asparion Clock is a free clock app for Windows 8. The app has many different tools: Clock, Timer, Alarm, Stopwatch, and Calendar. The special feature of this app is that it displays time and date on the Live Tile. You can customize the tile as per your choice from provided 40 different formats. Change the foreground and background of the tile as per your choice. 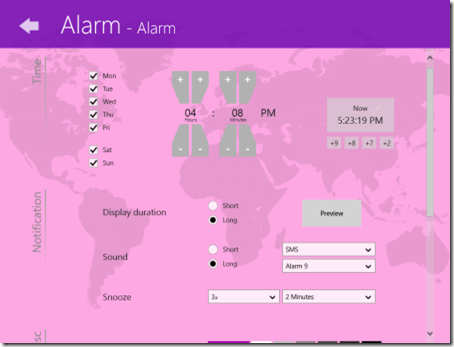 You can also set the alarm in your Windows 8 PC. It will alert you with sound and notification. Use Stopwatch, Calendar, and Timer as per your choice. You can also customize the background color, format, picture, name of Stopwatch, Calendar, and Timer as well. 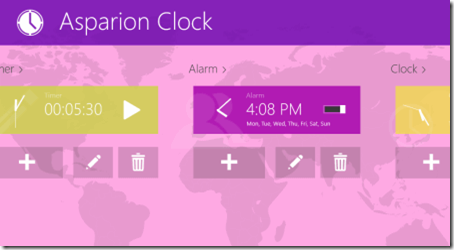 Get notification for your alarm and timer (if set any) directly on your Windows 8 desktop. Simple interface, and hence easy to use. Display time and date on the Live Tile. 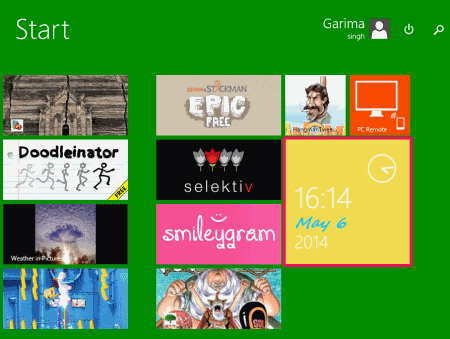 Customize Live Tile as per your choice, like: background color, foreground color, etc. Many other tools within single app: Clock, Timer, Alarm, Stop Watch, and Calendar. Get notification for your timer. Get sound alert and notification for your alarm. Choose one alarm tone from provided options. You can get Asparion Clock app free from Windows store by clicking on the link given at the end of this review. After launching the app, you will find different options: Timer, Alarm, Clock, Calendar, Stopwatch, General, Permissions, Snapped view, etc. The very first thing that you should do in this app is set the clock on the Live Tile. Click on the clock option to start. 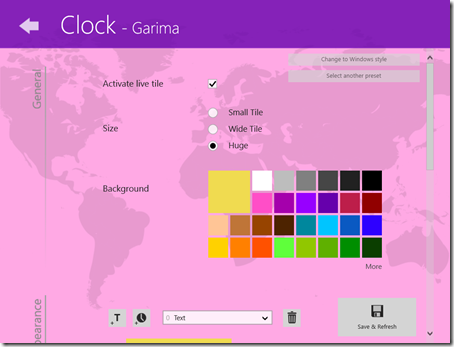 You will get different options to customize your clock: General settings (Activate Live Tile, Size, Background Color) and Appearance Setting (Format of Live Tile, Font Style, Foreground color, etc. ). 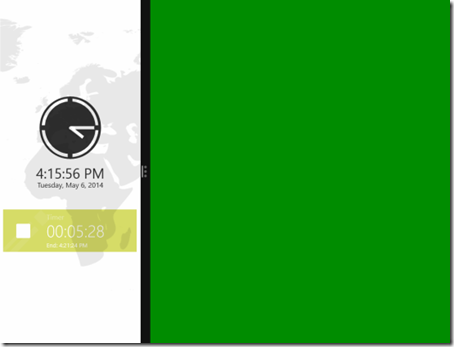 Click on Activate Live Tile to show the clock on the Live Tile (to Change the size of the Live Tile, right click on the Live Tile). 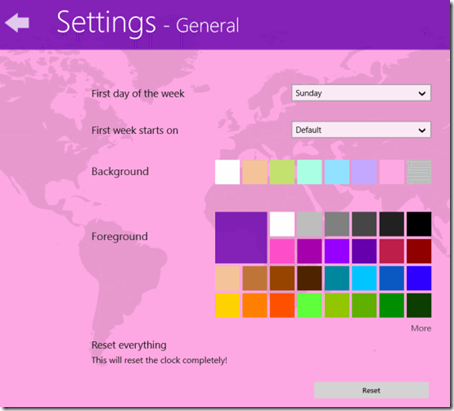 Choose the background and foreground color from provided options for your Live Tile. Change the font, time format, and style as well from the same option. 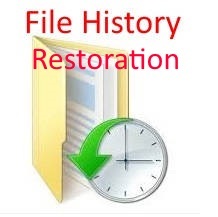 If you want to change the name of the clock, then click on Change to Windows style option available at the top right corner of the screen. Set Time and the days on which you want to repeat the alarm. Display duration for notification, snooze option, and sound. Choose any alarm tone as well from provided options. Change the background color and picture that you want to display in notification. The additional tools of this app are Timer, Calendar, and Stopwatch. You can customize these tools as well. You can customize the color, First day of the week, first week starts on, etc. by clicking on Settings option. This app also works well in snapped mode in your Windows 8 PC to track time, and to check timer.